This guide is about improving your damage (DPS) as a Beast Mastery Hunter in PvE (Raids and other instances.) If you are looking for info on leveling or PvP check the links just below. Updated for Mists of Pandaria 5.4.8 with some Warlords of Draenor notes. Warlords of Draenor is coming soon. Some comments about that will be added below, but to see all of the Hunter changes see this our Hunters in Warlords post. 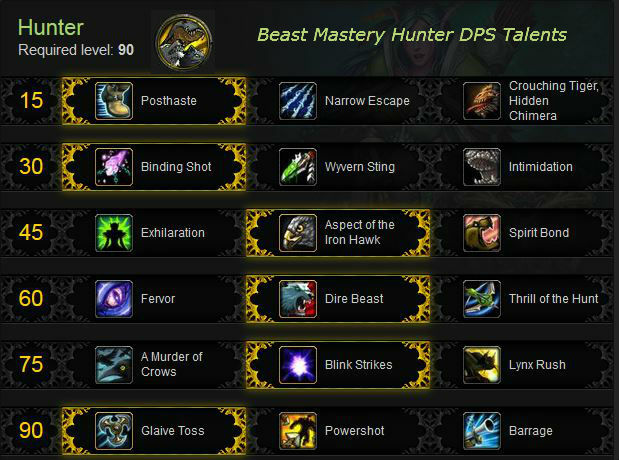 This Beast Mastery Hunter guide is primarily intended for use in PvE and Raids at level 90. However, the principals will still apply during the leveling process. If you’re looking for advice on leveling your Hunter, check out our Hunter Leveling Guide. Our picks are checked: and descriptions are below the image. Depending on the encounter you might want to switch some talents about, such as swapping Glaive Toss for Barrage. Keep a stack of Tome of the Clear Mind in your bags and switch talents/glyphs as necessary. It’s cheap and easy. Each of these modifies Disengage in some way and offers no direct benefit to DPS. Speed is nice, webs have occasional trash use, and reduced cooldowns are good. Your call on this one. We’re going with the need for speed. Posthaste gives us a speed boost when disengaging and breaks movement impairing stuff. Has it’s uses, but is a better PvP talent. Narrow Escape is unlikely to benefit us in any great way. Nice for some PvP and very nice for those occasions when a bunch of trash takes a liking to you. Crouching Tiger, Hidden Chimera reduces the cooldown on a couple of our survivability options. This is my recommended choice although the other two can be viable depending on the situation. Crowd control. Each one has its value and none will affect most bosses. Binding Shot – this is the only one that has any area effect use and is grate for enemies that move around alot. Wyvern Sting is decent CC, fine for sleeping an incommin gadd, but unlikely to majorly effect an encounter save on rare occasions. Intimidation – your pet briefly stuns (and interrupts) the target. 1 min cooldown. A heal (and a big pet heal) every 2 min Vs a small amount of damage reduction Vs a constant heal. Which fits your game the best? Exhilaration is a self-heal for a decent amount of health. Not a bad choice, esp. since it’s a big pet heal. Decent pick if you only expect to be taking the occasional big damage, as opposed to more constant damage. Aspect of the Iron Hawk grants us some damage mitigation when using our preferred Aspect. The damage reduction is nice for constant damage situations (and it active Vs all damage) and make your healer’s job a bit easier. It’s our pick since it’s passive and does not require your pet to be alive. This talent becomes Iron Hawk in Warlords, and loses the Attack Power boost. Spirit Bond is a minor, constant healing effect so long as your pet is active, which should be always. Do you want a constant heal or damage reduction? If you pet dies a lot then Iron Hawk might be a better choice. Three ways to more quickly recover Focus. Fervor for Burst damage, Thrill of the Hunt for more constant DPS, and Dire Beast for an added pet and the damage it provides. Dire is the best overall DPS gain. Fervor returns focus both instantly and over time, but is inferior to the other two for longer fights. Note that at high gear levels Fervor is pretty solid and competitive, helping to smooth out rotations esp. if you’re using A Murder of Crows. Cast Fervor, then Murder. Dire Beast is the recommend choice for this time as it provides the greatest DPS fo the three talents in this tier. Simmon up a big beast for added damage and additional focus. Note that the beast can get stuck, like any other pet. Thrill of the Hunt has a chance to give you focus free Arcane Shots or reduced cost Multi-Shot, but the ultimate contribution of this talent is inferior to Dire Beast. Blink Strike is very nice for making sure that your pet is on the target right now. The damage increase is always on, regardless of whether or not the pet is blinking. It’s passive, so one less button to mash. You pet does more damage and does a better job of sticking to the target. Sounds good to us. Lynx Rush is a decent talent, but the other two have advantages over it. In Warlords this talent is dead. It is replaced by Stampede. The best choice here really depends on how many you are fighting. Glaive is the best single target choice and Barrage the A of E choice. Damage for all of these will change in Warlords. Glaive Toss is the optimal DPS choice for single target attacks. Powershot is inferior to the others, but could be useful in some situations. Barrage is better if you’re doing lots of Area Effect fights, such as when the adds charge in. Note that these will probably change before Warlords is released. Exotic Munitions. You can change ammo types, each change lasts an hour. Pet abilities are changing in Warlords. CC is being removed, for example. See here for more. There’s very little in the way of direct DPS glyphs for Hunters, but dead pets (and Hunters) do no damage so there is a lot to be said for not dying. Change glyphs to suit, make sure you have a stack of Tome of the Clear Mind available to do that. Glyph of Animal Bond boosts the healing you and your pet receives by 10%.Great if you’re taking any regular damage. Glyph of Deterrence increases your survival when there’s enough raid-wide damage to be worth it. The rest pretty much depend on your game and the exact situation. Glyph of Liberation provides a small heal when you Disengage. This is learned automatically in Warlords. Glyph of Disengage Leap back further when you Disengage, might be useful for movement phases. Glyph of Mending – increases the healing your Mend Pet does. This is learned automatically in Warlords. These are mostly cosmetic, so pick ones that suit your style. Glyph of Revive Pet – makes reviving your pet easier when things get iffy. It’s the only important minor glyph. Glyph of Stampede – Might have some DPS value if your current pet if you best DPS pet and the others are for other uses. Might cause issues with some addons and recount. The rest are just for fun. Glyph of Fetch – Your pet loots for you. Glyph of Lesser Proportion – a lightly smaller pet. Keep in mind that perfecting your rotations will result in a far better DPS gain than having “exactly the right” stats. LOTS of practice will do a lot more for your DPS than anything else. Useless stats: Hit and/or Expertise over 7.5% each. The exact “best stats” (among crit, mastery, haste) depend on your gear level and the exact pieces you have. For example, Haste becomes increasingly valuable as you obtain items that randomly proc agility, as it gets you more procs over time. Crit > Mastery > Haste is more appropriate for lower gear levels, eg: fresh 90s to ilevel 500ish. Weapons: Item level pretty much trumps everything. A big jump in iLevel is better than most anything else. Agility is your best stat. It adds damage and a small amount to your Crit rating. You will want to cap both Hit and Expertise. Your pet inherits half your Hit and Expertise ratings, so both of these have some value beyond the 7.5% cap, but your pet really only needs the Hit. Both your Hit and Exp factor into your pet’s Hit. So if you cap your Hit and Exp the your pet will have capped Hit and all is good. Hit and Expertise are both being removed in Warlords. Your attacks will have a 100% chance “to hit” and a 3% chance to be dodged. Crit and Mastery work very well together, but as gear gets better Haste becomes better than Mastery. Haste isn’t so hot these days, at lower gear levels, but it becomes better than Mastery at high gear levels. If you find yourself with at least a couple of pieces of gear that randomly proc stats then you may find that Haste is even better than Crit, since lots of Haste will give you more Agility procs over time. Your #1 priority is to get both Hit and Expertise to 7.5%. Slightly over is better than slightly under. After that reforge weaker stats to Crit and then either Mastery or Haste, depending on your gear level. In Warlords reforging is dead. Serpent Sting will be Survival only. Cobra Shot will be replaced by the level 100 talent Focusing Shot, if you take that talent. Rapid Fire will be Marksmanship only. Lynx Rush is dead and Stampede is a lev 75 talent. Frenzy has been removed and its effects have been incorporated into Focus Fire. The Beast Within has been removed, but Bestial Wrath now naturally includes the effects of The Beast Within. Pet abilities will change, some will bring new raid buffs. Attack from behind where possible. Your shots can be blocked as well as dodged. Attacking from behind removes the chance to be blocked and will increase your DPS. Attacks from behind can be dodged and that is what your expertise is for. 7.5% Hit and Expertise means that you will never miss or be dodged. Aspect: You should have Aspect of the Hawk active at all times unless in a movement intensive fight in which case Aspect of the Fox is your best option. The Iron Hawk talent, if you took it, reduces all incoming damage. Your first priority in any fight is applying Hunter’s Mark to your target followed by Serpent Sting. Serpent Sting should be maintained, but in this case we’ll be using Cobra Shot to do so therefore you should only have to apply Serpent Sting to a given target once. Cast Kill Command on cooldown. Focus Fire should be used when your pet has 5 stacks of Frenzy for maximum effect to grant yourself a 30% ranged Haste buff for 20 seconds. The only time you wish to avoid doing this is when you’re about to use Bestial Wrath in which case leaving your pet’s stacks of Frenzy going is the best choice for maximum DPS. When Bestial Wrath fades you then instantly use Focus Fire and continue as normal until ready to use Bestial Wrath once more. Arcane Shot is your focus dump should you have an excess at any point in the fight while Cobra Shot is used to restore Focus. Keep your Tier 4 talents in mind as you will have enough focus, with these, to do more Arcane shots. Use Kill Shot when your target drops below 20% health. When facing multiple target use Multi-Shot as often as possible followed by Cobra Shot to restore focus before returning to Multi-Shot. All of your DPS cooldowns should be used as often as possible, meaning Rapid Fire, Bestial Wrath, Lynx Rush and Stampede.This includes the Orc and Troll racials. Your Pet’s Rabid ability should be triggered as often as you can and if possible stacked with other pet DPS abilities such as Bestial Wrath or Lynx Rush. All of your tier 4 talents will restore/provide enough focus to dump more Arcane Shots. Dire Beast should be used on cooldown for maximum DPS and focus regen. If it is NOT agility than you’re better off with a pure Ag. gem. Several extra gems are shown here in case you need certain stats or colors, such as if you need to get more Hit or Expertise. Generally though you’ll go with a red gem or an orange or purple agility hybrid. Try to get your Hit & Expertise through reforging, not gemming. Gems are listed below if you need either stat after reforging. Yellow: Deadly Vermilion Onyx only if the socket bonus is Ag. Otherwise use the delicate gem. Blue: Glinting Imperial Amethyst only if the socket bonus is Ag. Otherwise use the delicate gem. Meta Capacitive Primal Diamond: +324 Critical Strike, and chance on melee or ranged hit to gain Capacitance. Requires the legendary quest line. This gem is much better than the Agile diamond. Enchant for Agility, where possible. Hit and Expertise should be had via reforging or, failing that, gemming. If you have the Alchemy skill the effect and duration of flasks and elixirs will be increased, including the value of secondary stats, by about 30% and an hour. Foods are available that provide secondary stats, but they’re only worth about 200 points. Your Mail Specialization adds to all Ag. bonuses. Flasks – The one Flask is better than any paid of Elixirs, so only the Flask is shown here. Flask of Spring Blossoms: 1,000 Ag for one hour (better than any combination of elixirs. In Warlords all combat bonuses from the professions will be removed. They will be for gold making and/or flavor only. In Mists all of the professions provide some benefit for any class/spec, though clearly some are better than others. Even the gathering professions have some value, though you might be better served by using those to build a larger gold stash. Most of the professions add an average of about 320 Agility. Since gems with secondary stats are twice the value of those with primary stats (320 Crit Vs 160 Int, for example) Blacksmithing might be the most valuable profession if you’re just looking for the buffs. It depends on which holes you’re looking to fill. Since you will be able to use any gems in those slots you will have a certain flexibility that’s lacking with the other Profs. Engineering has a very nice Ag. cooldown and might be worth taking just for that, not to mention all the other cool toys. A repair bot is a nice thing to have towards the end of a raiding session. Herbalism has a big Haste cooldown. Blacksmithing gives two extra gems slots. Since gems with secondary stats have twice the value of gems with primary stats Blacksmithing might be a very valuable profession. For example, you’ll be able to socket the two gems for 640 Mastery instead of 320 Ag. Herbalism Small heal and 2880 Haste for 20 seconds, plus you will find healing spirits. In Warlords of Draenor (WoD) Hit and Expertise are removed, so any racials covering those two stats will also disappear or change. Gnomes are still excluded from the Hunter class. 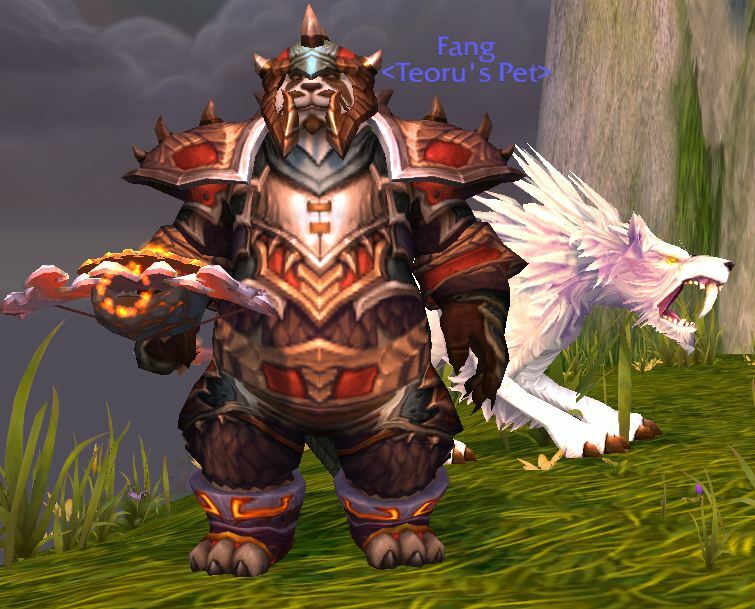 In Mists of Pandaria the Gnomes are still excluded from the Hunter club, but Pandarens can become Hunters. The best racial choice for a Hunter is one that you enjoy playing. It doesn’t matter if one race has no special abilities if you like playing that race more than others. None of the racial abilities make that much of a difference and they are all overshadowed by your skill as a player. That said, if you’re looking towards the end game… Orcs and Trolls are arguably the best Hunter races and the Pandarens get a very nice food buff. Here’s a summary of offensive racials, more detail is below. Worgen: Increased crit chance and a “Sprint” cooldown. It certainly makes sense that were-wolf type critters could be Hunters, what with their legendary sense of smell, not that said sense appears in-game. They have a general 1% increased chance to crit, which is a good stat for you, and they can “periodically move more quickly,” which definitely has it’s uses. Draenei: +1 Hit helps with gearing. +1% hit, a useful self-only ability for raiding hunters as every point of hit rating counts once you hit the endgame raids. WoD: The +1 Hit is dead, but is replaced by a bonus to Ag. Also, the heal is faster. Dwarves: Ranged expertise helps with gearing. Dwarves get expertise with ranged weapons, which is definitely useful. WoD: The ranged expertise is dead and Stone Form is improved. They have nothing that’s specifically useful, though their escape ability is quite nice for PvP and occasionally of use in PvE. WoD: The Human Spirit now increases two of your secondary stats, making it a lot more useful to you. Night Elves: No DPS abilities. Night Elf hunters also gain the benefit of a 2% dodge chance increase, another bonus to stack with Aspect of the Monkey when forced into melee. This will only rarely be of any use to you in PvE. WoD: Touch of Elune is a new passive ability which increases your Haste by 1% at night and your Critical Strike chance by 1% during the day. Also, you get a 2% movement speed increase along with your 2% dodge chance. Orcs and Trolls are the best of the Hunter races, for either faction. Both get nerfs in WoD. Trolls are the one of the two best of all the races for Hunters, with three abilities increasing DPS. Trolls possess the Berserking racial, a potent DPS increase (greatly increased attack speed) for sustained DPS. Trolls get Ranged weapon expertise, which is quite nice for you. Trolls also get +5% damage bonus Vs. beasts. Some of the trash mobs found in PvE content count as beasts, so this will be occasionally very useful. WoD: Berserking is nerfed a bit and the ranged expertise is dead. Your Beast Slaying ability no longer adds damage to beasts, only XP gained. Orcs, on the other hand gain, are also a contender for “best Hunter race,” with two DPS increasing abilities. WoD: Command adds 1% damage. Hardiness is nerfed to 10%. They have no special Hunter abilities, but their “Will of the Forsaken” can wipe off sleeps, charms, etc., a nice ability to have, especially in PvP. Undead can drain life from opponents and be healed for the same amount. This is a passive effect and happens occasionally with your damaging attacks. WoD: The cooldown for Will of the Forsaken is increased. Underwater Breathing returns and is improved. Goblin: Small DPS increase via +1% Haste. Tauren: Warstomp has occasional use against trash. Tauren are another “just Ok” Hunter race, gaining a 5% bonus to health that is occasionally useful. You’ll also gain the benefit of Warstomp, an AoE stun that may allow you to gain range from the opposition. Stomp to Disengage, for example. WoD: The health bonus is changed so that it scales better with your level. Of the horde races we’ll begin with the Blood Elves, a “meh…” race, as far as Hunters are concerned. Their big ability is Arcane Torrent, which can be used as an AoE silence/interruption when forced into melee range with caster types. Ideally Hunters want to avoid “melee range” like the plague. AT also restores a bit of Focus. WoD: Arcane Acuity is a new racial passive ability that increases Critical Strike chance by 1%. So you gonna buy (for $60) an Insta-90? Or take a bit more time, and save money, to level your own? You spend more time, and have to do those last ten levels in Warlords anyway and get to learn your character, get gold, get reps, etc. Your call. I’m, leveling the old fashioned way, with a guide. A Guide? Now WoW’s in game quest helper is a nifty gadget, showing you where to go and giving you some idea of what to do. What it doesn’t show you is the most efficient path to take among all the bazillion quests and it misses by quite a bit in the “where to go and what to do next” departments. 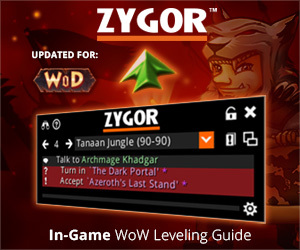 Zygor’s guides misses nothing and show you the best path to take, whether Horde or Alliance,at all times, and even displays an arrow showing the right way to go. Zygor’s has gemmed for Int and, as a result, it doesn’t matter if you stop your questing to gain a few levels in PvP or the dungeons, you’re brand new to the game or you’re decked head to toe in heirlooms. Come back to the quests and Zygor will figure out where you should be, based on your new level, and update the guide accordingly. It’ll even let you zap your obsolete quests. So if I am reading this correct I need 7.5% in BOTH hit AND expertise or 7.5 between them? I have been reading that on a few guilds for classes and want to make sure im doing this right and not over stating myself. Yes, 7.5% Hit and Exp. Everyone needs 15% total for M of P raid bosses. Casters need their 15% Spell Hit, which combines Hit and Exp, everyone else needs 7.5% of each. Gems can quickly bring you up if your reforging doesn’t quite get you there. I still have binding shot on my hunter not silencing shot. Is this wrong or did things change again after this was posted? Binding shot was removed in an earlier patch and replaced in 5.4. Silencing Shot is now Marksmanship only.